Poll: What are your Black Friday plans? The National Retail Federation predicts more than 137 million Americans will shop during Thanksgiving weekend, topping last year’s retail frenzy. But here in the newsroom the buildup to Black Friday has felt noticeably muted this fall. Typically we’re inundated by press releases from retailers in November. E-mails pour in from big chain retailers touting extended hours and price-slashing sprees. Local shops give us friendly prods for coverage of Small Business Saturday. Online sellers send constant Cyber Monday reminders. This year we’ve received a smattering of those promotions, but not the typical deluge. So we’re interested hearing your take on Black Friday. Have the deals been hyped as much this year as in years past? Is shopping a part of your Thanksgiving week tradition? Do you have other ways you prefer to spend your post-turkey holiday? Let us know by taking our poll (you can pick more than one answer) or dropping a comment below. And whatever your plans, have a happy and safe Thanksgiving! How will you spend Black Friday? I'll be gobbling up Black Friday deals. I'll try to get outdoors. I'll shop at local stores on Saturday. I plan to do my holiday shopping online. 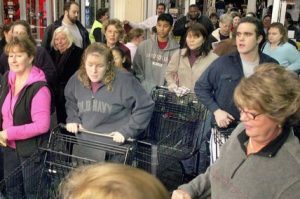 I may go shopping, but not during the Black Friday madness.